The scientific community and the world at large was taken by storm last week when an international team of scientists managed to detect gravitational waves, finally confirming renowned physicist Albert Einstein’s century-old theory of General Relativity and opening up a brand new vista of the cosmos. This team, known as the the Laser Interferometer Gravitational-Wave Observatory, or LIGO, includes some of the brightest minds on the planet, and one of them happens to be Sri Lankan. LIGO member, astronomer, and postdoctoral researcher at the Texas Tech University in Lubbock, Texas, Dr. Nipuni Palliyaguru spoke of her contribution to this monumental discovery. 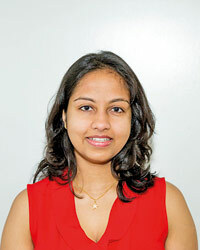 Dr. Nipuni Palliyaguru is part of the LIGO electromagnetic follow up team. Having joined LIGO as part of her postdoctoral research, about six months ago, Dr. Palliyaguru became involved in a collaborative effort to pinpoint the elusive signal. “It is a collaboration that consists of many scientists from around the world who are working on different aspects of gravitational wave signals. I am part of the electromagnetic follow-up team of LIGO,” she said. As to how it works is, in her own words, “The idea is, when a signal comes in, we send out alerts to partner telescope facilities all around the world. According to Dr. Palliyaguru, team members take turns to be on-call, as these events are unpredictable and can occur anytime of the day. Special care is taken to ensure that there is no room for false alarms. “You have to carefully check for instrument status and for glitches in the data to make sure an event is real. Then we decide whether or not to alert the partner astronomers. It is a lot of fun to be on shift, especially when a trigger comes in. Then, because I’m also an astronomer, I got to do the actual follow-up observations for this event,” she said. A lot has been said about LIGO’s detection and its significance, but as is often the case with popular science (pop-sci), there seems to be a lot of miscommunication surrounding it. For example, a local TV news segment described it as a confirmation of the wave-like property of gravity, in a strictly Newtonian sense of the concept. As a scientist who was actually part of the project, Dr. Palliyaguru helps shed some light on this. “Sometimes you have to use analogies to make the information more accessible. We say gravitational waves are ripples in spacetime, kind of like ripples in a pond. Gravitational waves basically distort the space so the time that light takes to travel between two points in space changes. This is the basic principle of any gravitational wave detector. They are called waves because they actually follow the usual wave equation in physics,” she said. Going into further detail, Dr. Palliyaguru explained that light, as we know it, or more specifically electromagnetic radiation, is generated from accelerating charges (such as electrons). Gravitational radiation is generated from accelerating masses. When she was a PhD student at West Virginia University, USA, Dr. Palliyaguru heard what she calls a very inspirational talk about efforts to detect gravitational waves using pulsar timing arrays (PTAs). It was then that it hit her: she was in this for life. “Ever since then, I knew this was what I wanted to work on, for the rest of my career. So I worked on PTAs for about five years for my PhD. Then I got the offer to work with the Texas Tech group as a postdoc (post PhD research) on LIGO science. I was thrilled to get the opportunity to continue gravitational wave science with a sophisticated detector,” she said. A product of the Sri Lankan education system, Dr. Palliyaguru spoke about her days as a student in the island. “Before any of this, I was a physics major at the University of Colombo and a student at CMS Ladies’ College in Colombo even before that. So yes, I did go through the local system and had very inspiring physics teachers from a very early stage,” she recalled. The implications of LIGO’s work are many and will have a profound impact on our understanding of the universe. It is every science student’s dream to be even a small part of something so big. “I’m still in the early stages of my scientific career, so I’m not sure if I can say a whole lot, but I think perseverance and grit is what it takes. Also, not letting opportunities go to waste. When bad things happen, you cry for a day, and the next day you wake up and pick up from where you left off,” she said.